29/06/2011 - OECD Secretary-General Angel Gurría has congratulated Christine Lagarde on her appointment as the IMF’s next Managing Director. Her selection was “a well deserved recognition of the leadership and qualities she has demonstrated as a minister of finance and during France’s presidency of the G20,” he said. 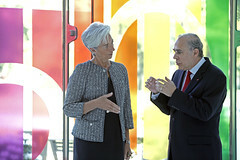 Mr. Gurría added that the OECD stands ready to enhance the existing close collaboration between the OECD and the IMF and to build on the experience his Organisation has had in working with Ms. Lagarde in her previous position and within the G20.